Popcorn is healthy snack when you pop it yourself because you can control the amount of oil and salt you use to prepare it. The healthiest oils to use when preparing popcorn are the same ones recommended for cooking other items. Choosing the right oil will keep your saturated and trans fat levels down and also protect your heart health. A cup of oil-popped popcorn contains only 55 calories, according to the Popcorn Board. Canola oil is a monounsaturated fat--a type that lowers your cholesterol and reduces your risk of heart disease, according to the Mayo Clinic. Canola oil also is low in saturated fat, but contains omega-3 fatty acids, important nutrients for heart health. That makes canola oil a healthy choice to use for making popcorn. Canola oil also has a mild flavor that won't change the taste of the popcorn. The oil has a medium-high smoking point, so watch it closely. Once it begins to smoke, it will produce health-damaging free radicals, the Cleveland Clinic says. Family Education recommends using olive oil as one of your primary cooking oils because it is high in monounsaturated fats that are beneficial to your health. Cooking popcorn in olive oil decreases your risk of high cholesterol and cancer thanks to its phytochemical content. Phytochemicals are found in plant foods and are important for good health. The flavor of olive oil varies depending on whether it is extra virgin, virgin or light-flavored. The more virgin the olive oil, the more flavor you will get from it--and the less you'll need to make popcorn. The Cleveland Clinic ranks extra virgin olive oil as the best pick for cooking. Safflower, corn, sunflower, soy and cottonseed oils are rich in polyunsaturated fats, according to the Mayo Clinic. Replacing butter with vegetable oil can cut your cholesterol level, which helps to protect your heart. Each of these oils provides a different flavor, so try them all to see which you like the best for cooking popcorn. 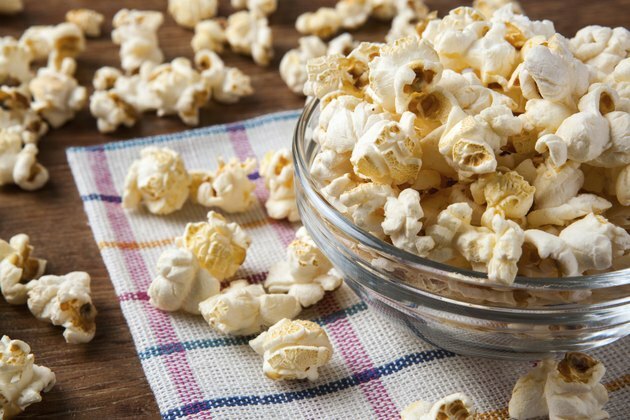 The ones with a more intense flavor allow you to use less, which keeps calories low, making oil-popped popcorn a healthy snack that fits well into a balanced diet. The American Heart Association recommends getting most of your daily fat from oils like vegetable oils for good health benefits.